I have come to realize that most people do not understand what grace is. One person on Facebook recently gave a good simplistic definition of Grace. They said that "Grace is God's great enabling power." This is a basic but great definition of what grace is. But I would like to go into more detail on what the Church teaches about grace over the next few weeks. Grace is from God, who has blessed us IN Christ. Paul, an apostle of Jesus Christ, by the will of God, to all the saints who are at Ephesus, and to the faithful in Christ Jesus. Grace be to you, and peace from God the Father, and from the Lord Jesus Christ. We have been redeemed through the grace granted in Christ Jesus: Christ merited the supernatural gift of God. Redeemed-delivered us-to redeem means to free or buy back. Humanity was held captive in that it was enslaved by sin. Merited- a reward for the practice of virtue. So Christ Jesus was divinely rewarded for his sacrificial death on the cross. Jesus in turns offers to those who will except it, the supernatural, free gift of grace. We have been justified by the grace of Jesus Christ our Savior. 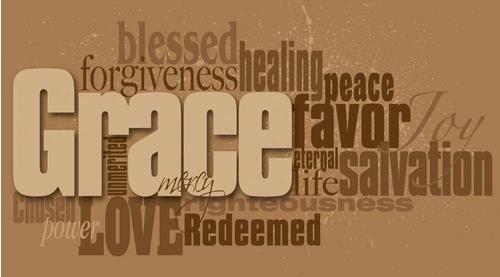 The grace is from Christ our Saviour, and the grace is the supernatural gift of God. Supernatural Gift-a gift of God that is conferred on man that is above all the powers of created nature. In other words it is something that is given that we could never get on our own. Not by the works of justice, which we have done, but according to his mercy, he saved us, by the laver of regeneration, and renovation of the Holy Ghost; Whom he hath poured forth upon us abundantly, through Jesus Christ our Saviour: That, being justified by his grace, we may be heirs, according to hope of life everlasting. (Titus 3:5-7). The Laver - the sacred wash-bowl of the tabernacle and temple (Exodus 30:18 Exodus 30:28 ; 31:9 ; 35:16 ; 38:8 ; 39:39 ; Exodus 40:7 Exodus 40:11 Exodus 40:30 , etc. ), a basin for the water used by the priests in their ablutions. So when we refer to the Laver of regeneration, we are referring to being born again through the sacrament of baptism. but not only are we born again by the Laver, But we are renovated by the Holy Ghost! Renovation- to restore to good condition; make new or as if new again; repair; to renew. The renovation of the Holy Ghost is the renovation, the repairing, the renewing of the mind. St. Ambrose-"Who is the one who is born of the Spirit and is made Spirit? It is one who is renewed in the Spirit of his mind." The renewal of the mind is what the Holy Spirit does as we continually surrender to his desire to renovate it. Justified by his grace (Titus 3:7)- In Christian theology, justification is God's act of removing the guilt and penalty of sin while at the same time declaring a sinner righteous through Christ's atoning sacrifice. This is something we are not able to do on our own. It takes the grace-the supernatural gift of God-something we could never get on our own- to be justified. And that grace comes being by being born again in the sacrament of baptism and the renovation of our minds that the Holy Ghost does on a daily basis. Next I will be talking about two kinds of grace: sanctifying grace and actual grace. Neither of these actual names occur in the Sacred Scripture just as the word "Trinity" is not found. Not to worry. We will find plenty of descriptions of both kinds of grace.